There’s a lot of hype around using blockchain to trace supply chains. How does it stand up in the real world? The most widely publicized blockchain pilots involve shippers and retailers - the ‘last leg’ of a global supply chain. What happens when you want to trace a product from the source, and that source is halfway around the world? Global supply chains include people from every walk of life, from smallholder farmers to corporate executives. The challenge with traceability is finding a solution that can handle the complexity of global trade while being easy to adopt each step of the way. Sourcemap uses proven technology, including the graph databases that power social networks and mobile apps that work on the most common devices. And of course, spreadsheets. You can trust the data. Everything that’s uploaded to Sourcemap is encrypted and changes are tracked, so there is no chance of someone altering a record without being detected. And the app is lightweight, so it’s used to capture lots of additional data: farm areas, workforce statistics, indicators for safety and hygiene. You can rest assured, not only that the source of products is authentic, but also that important risks such as child labor and deforestation are minimized. Traceability isn’t about blockchain, it’s about digitizing the supply chain. Once paper- and spreadsheet-based records are uploaded to the cloud, the savings are immense: no more document handling, better quality control, fewer delays and disruptions, less risk. To learn more about the agile ways that end-to-end traceability is being implemented in supply chains around the world, get in touch. We’d love to hear from you. 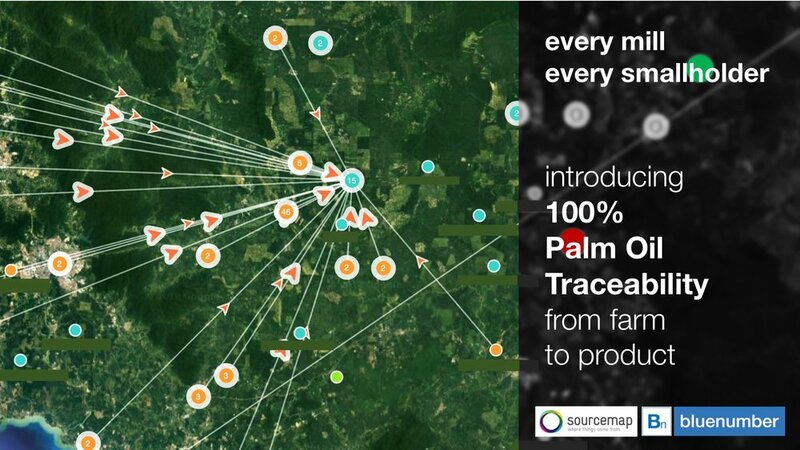 Sourcemap and Bluenumber are teaming up to deliver the first solution to trace both where palm oil comes from and who produced it. 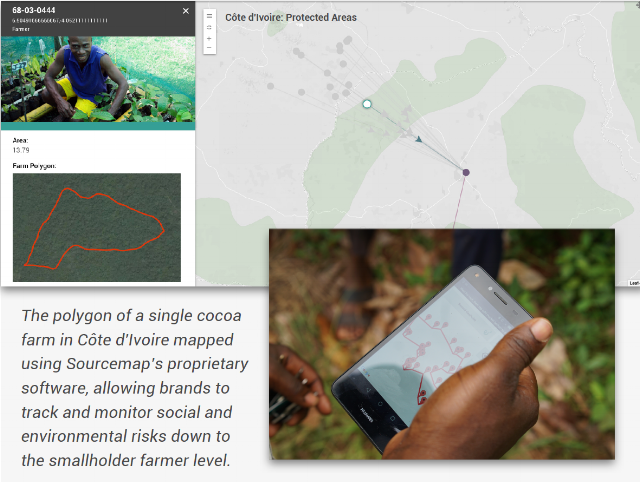 The leaders in supply chain mapping and unique smallholder identification have co-developed a service to present verified and visualized data cheaper, faster and with greater assurance than traditional certification or sample-based fieldwork. Sourcemap, the global leader in supply chain mapping and transparency, and Bluenumber, developer and host for an independent registry of unique digital farmer and worker identities have jointly developed two groundbreaking offerings for palm oil transparency and traceability. The new services plug current data gaps in industry standard sustainable palm oil sourcing practices by creating end-to-end visibility. Users can now prove with precision that their palm oil supply chain is deforestation-free and socially responsible. The basic 'Supply Map’ offering is designed to help buyers show their consumers and stakeholders from where and whom they source palm oil. The more advanced service, ‘Trace & Track,’ gives buyers highly detailed information on the origin, route and handling of every specific Palm Oil shipment received, including every smallholder and every mill involved in each specific delivery. The new solution uses a proprietary technology suite including GPS enabled data collection apps for fieldwork. Bluenumber issues unique identifiers to verify every smallholder, estate worker and facility at every stage in the supply chain. The Sourcemap platform organizes and visualizes all data necessary to understand and present verified smallholders, mills and other actors. The integrated systems establish the relationships and transactions between people and places. The resulting visualization and data analysis reveals time-calibrated activity of smallholders and estates. Risk data associated with each actor or entity allow buyers at multiple levels in the supply chain to make more informed procurement decisions on where and whom to source from. The solution works with palm oil supply chains that are certified under traditional programs, and with sources that are not certified. To learn more, please get in touch.